When putting your craft space together, it is always a good idea to keep your most-used tools in a handy space. With the Lovely Scissor Holder, your trusty scissors will always be within reach. This very simple scrapbuster project is perfect for beginners to work on, and the holder can hold far more than just scissors. 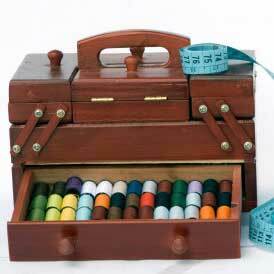 Use this finished product to hold all your necessary sewing supplies. This is an easy beginner project, and it can be sewn by hand or by machine. I used some denim dress fabric and lots of scraps to make this. It hangs behind my sewing machine, within very easy reach. Great pattern, easy to follow, very handy and well used every time I sew. Thank you for sharing this pattern. I have many friends who sew and also enjoy receiving sewn and hand crafted presents! What a great way to use up some fabric remnants. Many times I have some really elegant fabrics like velvety or tapestry but not enough to do something big. This project would work well for those and you could even piece the fabrics together for a quilted effect. Great project, thanks for sharing! This is a must project for any seamstress that loves to sew. I will be making this project and changing the fabric from denim as the backing to perhaps a chevron quilted backing would be my preference. I also like the convenience of having to choose different pockets and sizes. The hanging loop adds that special touch to display such a cute and fun and needed essential for my sewing room. Sissor holder shaped ln a heart is adorable and can be made to organize sewing notions. Also great for gift giving on valentines day for children to fill with cards from class mates. Made in various fabrics and colors. This heart-shaped scissors keeper is really great to have by the sewing machine. The tutorial is very easy to follow. The fact that it can be hung up on the wall is nice as well as it keeps little hands out of easy reach of the tempting colorful sewing scissors!